Chandra Image of Deep Field in Canes Venatici. 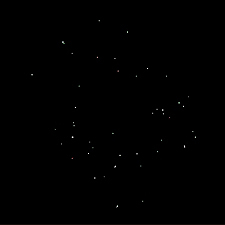 This Chandra X-ray Observatory image of a 27.7 hour observation of a region in the direction of the constellation Canes Venatici, close to the Big Dipper, shows about 3 dozen X-ray sources. Some of the sources were too faint to be seen by optical telescopes such as the Hubble Space Telescope and the Keck 10 meter telescope in Hawaii. 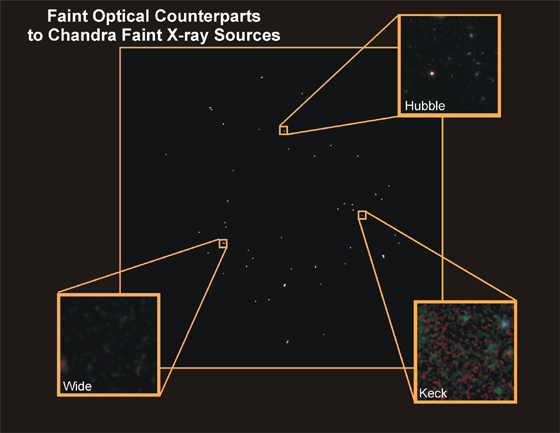 This new class of sources may represent some of the most distant objects ever detected. If this sample of the sky is typical, tens of millions of such sources must exist. Scale Image is 2.3 arcmin across.